Are you familiar with what a “Bounty Program” is? The concept is rather simple! Historically, a bounty was a sum paid to encourage or reward the completion of certain tasks. In the world of cryptocurrencies, a bounty comes down to completing tasks or “hunts” that helps spreading awareness about a project. As we are entering the final stage of the DSLA token sale, it is time to get started with the distribution of stakes to our community of hunters. Hunters, we would like to thank you for the time and energy you have put in supporting the project. Your response has been incredible and we were able to further spread the word about the Stacktical platform and reach out to a wide variety of crypto-enthusiasts with your precious help. #whenbounty ? How to get your stakes. There are no actions required on your side in order to obtain your stakes for the DSLA bounty program. The DSLA tokens your are entitled to will be automatically airdropped to the ETH wallet address that you have provided in the participation sheets. Stakes will be distributed between Feb 1, 2019 and April 15, 2019. Please refer to the dedicated file here. For security reasons, airdrops will be performed on the ETH wallet address you mentioned when you shared your contents with us. The Bounty Program is not (entirely) over just yet and we will be launching a referral campaign for the DSLA Token Sale very soon. Please not that you will need to contribute to the DSLA Token Sale to participate in the DSLA Referral Campaign. Please contact us at tokensale@stacktical.com with “Bounty” as a subject. We know how you love Telegram and Discord but this is the only way. Never share personal information with people pretending to be us online. Do not blindly trust anyone reaching out about the DSLA Token Sale in private discussions, no matter what social service you are using. 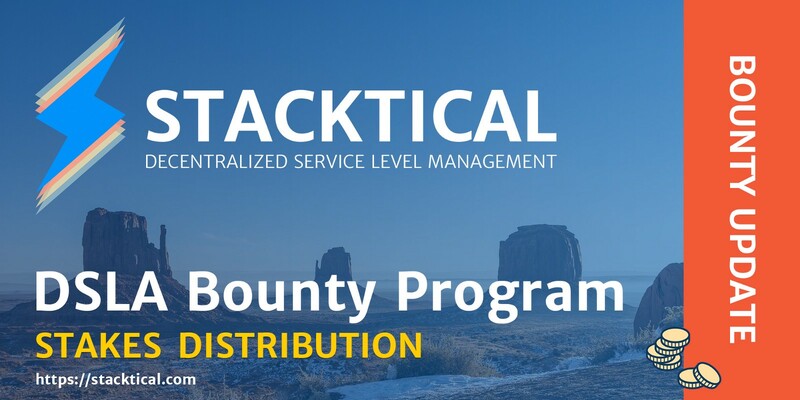 Our unique email address for all correspondence regarding the DSLA Token Sale and the DSLA Bounty Program is tokensale@stacktical.com. If you have any doubt, please contact us at tokensale@stacktical.com with a description and screenshots of your discussion. Stacktical helps online service providers transparently commit to a baseline performance of their services and automatically indemnify users when services do not perform as expected. It’s like an insurance ☔️ but for using apps, websites and other services connected to the Internet. For more information about Stacktical and the DSLA token, please visit https://stacktical.com. Stacktical a is french software company specialized in managing the performance of systems and the expectations of their stakeholders. Made in Paris, Designed around the World.